ReJuviClean is a unique formulation that both cleans and renews protection against oil, water and stains on concrete and stone surfaces. This product is designed for high-performance building restoration and preservation applications. This product is a specially formulated, proprietary blend of fluoropolymer chemistry and cleaning agents designed to clean stone surfaces while rejuvenating oil, water and stain repellency applications. This product is designed to be used on surfaces previously treated with Presto’s ReJuviSeal®, Protect-A-Stone® or Stone Guardian® products. If desired, ReJuviClean may be used on unprotected surfaces. Applying ReJuviClean five times is equivalent to applying one full-strength coat of ReJuviSeal. This product contains ingredients that react with the silica within the stone to form a protective barrier against water, oil and stains. Can be used on concrete, masonry and stone surfaces. Can be used on either horizontal or vertical surfaces. Dilute for use in concrete scrubbing machines or use full strength. Complete all caulking and surrounding construction substrate applications prior to using this product. Newly installed stone or grout must be allowed to cure before application. Protect against personal contact with this and all chemical products. Protect any unintended surfaces. Always test in a small, inconspicuous area prior to use. For heavily soiled surfaces, some pre-cleaning may be required. The use of deionized water is required to achieve full product performance. Do not apply in below-freezing temperatures. Use a low pressure sprayer, roller, brush, sponge or lambs wool applicator. This product can also be used in a pressure washing chemical injector or closed loop system. Allow product to saturate surface, but do not allow product to dry on the surface. Once soil is loosened, lightly rinse the surface with a pressure washer or garden hose. Do not apply direct water pressure to the stone while rinsing. Protection will begin immediately after sealant dries on the surface. Cure time for maximum water and stain protection is 24-72 hours. Application rates, concentration, temperature and humidity can impact dry and cure time. For buildings: This product is designed to seal precast while it cleans. It is suitable for a variety of stone surfaces, and functions to create an oil-, water- and stain-repellent finish. It protects against stains and is safe on glass and metal surfaces. 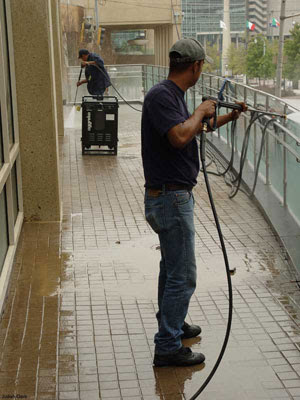 For parking garages: This product should be used to clean surfaces that need to be protected from water, oil and stains. For best results, use ReJuviSeal, oil-repellent finish, on the surface in order to protect concrete from vehicle stains like motor oil and transmission fluid. Use ReJuviClean on a regular basis with a street cleaner, concrete cleaning machine or pressure washer to maintain maximum repellency and keep the surface clean. For driveways: Driveways previously sealed with ReJuviSeal or Protect-A-Stone can be easily maintained using this product. Simply rinse down the driveway using ReJuviClean to clean any soils that may have accumulated and renew the water, oil and stain repellency. For Polished Stone: This product can also be used with a spray bottle and a rag to clean and install protection simultaneously on polished stone surfaces. For ongoing maintenance of the protected surface, simply wash or wipe the surface again with ReJuviClean. It will clean and protect the surface simultaneously. ReJuviClean is special order only. Call for pricing.